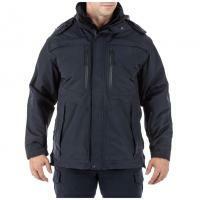 511 Tactical Bristol Parka Jacket (48152) FREE SHIPPING! Keep warm and stay comfortable during a stormy or wintry patrol with the all-new Bristol Parka from 5.11 Tactical. Added tactical enhancements combined with proven all-weather performance make the Bristol an ideal choice for duty professionals. The nylon shell is treated with a BPP finish for reliable weather-resistance, while the inner polyester jacket provides added warmth or can be removed upon wearer preference. Elasticized cuffs with adjustable hook and loop closures combined with the weather-proof YKK® Aquaguard™ outer zippers provide a secure, flexible fit. A sidearm is within easy reach at any moment with 5.11 Tactical's exclusive 5.11 Quixip® System, while important papers are kept secured in the patented hidden document pockets. Removable ID panels on the left chest and back and a badge tab on the right chest allow for quick identification. Mic loops located on both chest pockets make the Bristol a choice parka for any tactical operative. The construction of this jacket is great. I had it on when the temperature hit 2 degrees and couldnt tell that it was even cold out. Also on how easy it is to retrieve your side arm with its quick detach zipper. Highly recommended it. ©2002-2019 CopsPlus.com: 511 Tactical Bristol Parka Jacket (48152) FREE SHIPPING!